My dog hates the rain. I know a lot of dogs don’t love it, but Hadley takes it to a new level. Yesterday, I came home from work, and he was excited as usual to go for his walk. I put on my rain jacket (well Chris’s really, but it nice and big on me), and his mood went from let’s go let’s go to if we must. We got downstairs and were ready to exited the building when he started investigating the mat in the entry way. It was full of wet footprints. Well Hadley put two and two together, decided it must indeed be raining, and that he would not have anything to do with it. He turned around and headed right back to the elevators. I was happy there was a man there to see it, because someone got to share in my laugh at my crazy pup. When we got inside, he still rolled around on the couch like he does when he’s wet, just to make sure that none of the horrible rain managed to get on him. Silly puppy. I may hate rain, but I love snow! Take a water break and repeat above from 14-28 minutes. I was a sweaty mess when I was done! While I was foam rolling along, I received a nice compliment. A lady at the gym introduced herself as a trainer and complimented me on how I always work out hard. She then offered to train me, so the compliment may have been part of a the wooing process all along, but I still appreciated it. I would love to take personal training sessions, but that’s not in the budget. Perhaps one day. My evening from there was lovely. Usually I’m not done with the gym until 8, but since I went early, I was finished before 7. I was able to use my extra time to fix up a filling lunch for today of lots of veggies, potatoes, and Indian simmer sauce stir fried together. Sodarnfilling. The night ended in a good way: I popped Smartpop Popcorn and enjoyed it in bed watching American Dreams. I think popcorn and TV is my new favorite bedtime activity for those nights were Chris is working dreadfully late. That and of course cuddling with Hadley. Hug me, kiss me, love me. My Fourth of July weekend was all sorts of fabulous. Let’s recap, shall we? Friday: After work, I forced myself to run a 5K. I wanted to make sure I could do the length, since Chris and my first official 5K race (since I was in high school) is coming up soon. It wasn’t so bad! My biggest issue with the run was pacing myself. I went out too slow most of the time, since I was scared I couldn’t make the distance, and then ended up finishing with a lot more to give. I guess over time I will remember how to pace myself? When I ran in high school, I was able to autopilot whatever time I sought, but that skill is long gone. I guess there could be worse problems. The run paid off. I already proved I will run for pasta. Well, I’ll also run for Mexican. Chris and I meet up with Lauren and her BF for Mexican food. 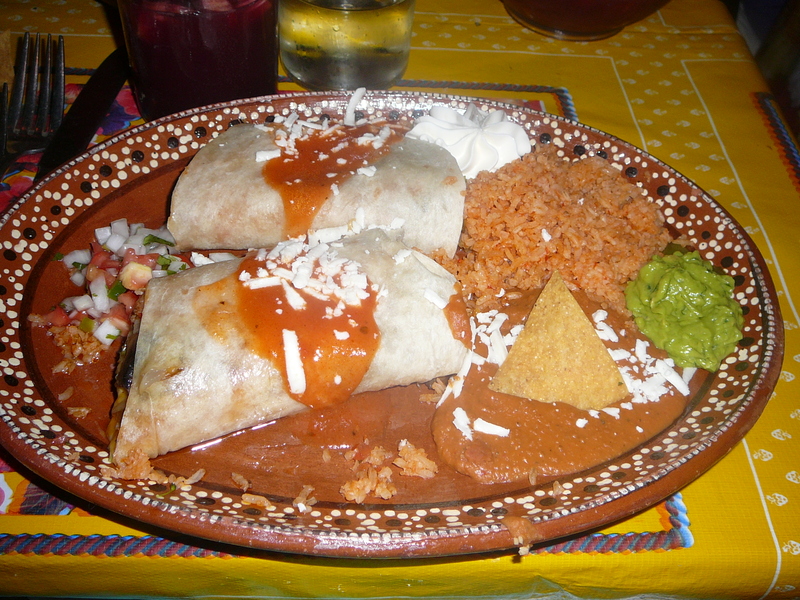 It was finally good real Mexican food, none of that fancy NYC Tex-Mex that drives me nuts. We shared guac to start (fresh-made at our table = awesome), enjoyed sangria (BYOB wine and they do the rest), and I polished off my entire veggie burrito plate, rice and all. I paid for that with a food coma, but it felt so worth it at the time. Insane amount of Mexi food. After dinner, I watched my new obsession HGTV, and Chris and I fantasized about buying property all over the world. Julian Alps, I’m coming (one day) to you! We ended the night watching She’s Out of Your League. Good concept, but meh movie. Saturday: Woke up early for a Saturday (before 9AM = early on the weekend) and headed down to my brother’s place near Princeton. Hadley meet bro’s adorable pup that he rescued last month, Rider, for the first time. At first Rider was timid, but Hadley showed him the ways of the good life. 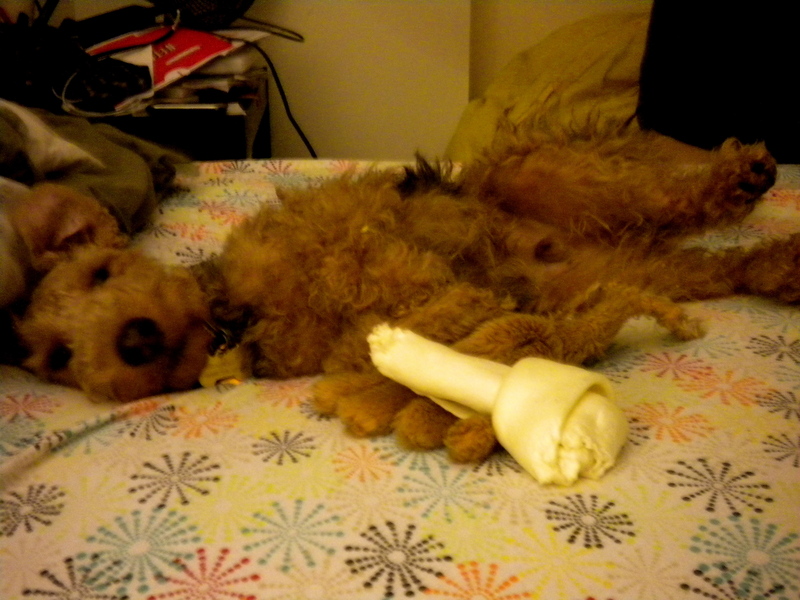 By the end of the weekend, Rider was all play all the time. 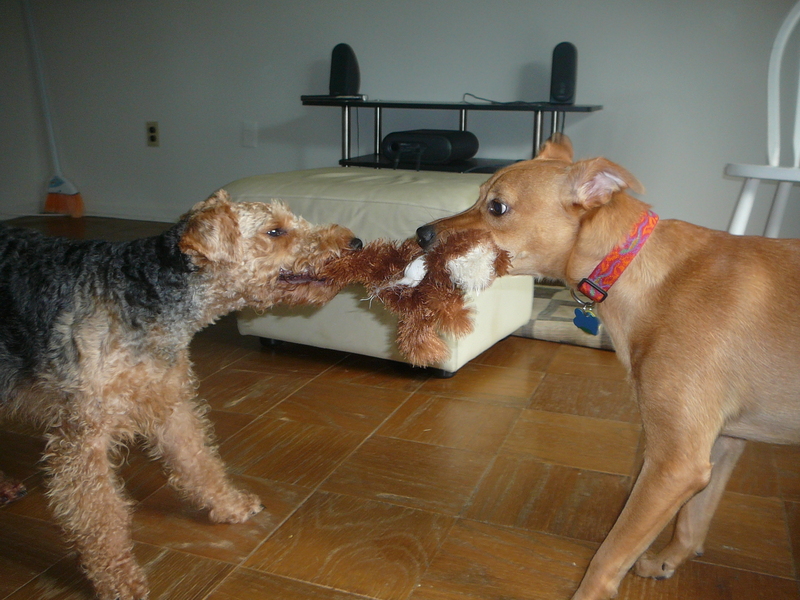 Hadley and Rider playing tug of war. After introducing the pups, we took them on a hike that lead to a pretty waterfall. Hadley was even brave enough to follow us into the water, but then freaked out a little (water and kayakers are Hadley’s two big fears). Even with lifeguard Hadley (I swear he thinks that water is dangerous and only he can save us from it), it was a great way to spend the afternoon. The evening was spent in New Hope, PA. My brother’s GF recommend an awesome garden restaurant there that offered American, Italian, Thai, and Mexican food! 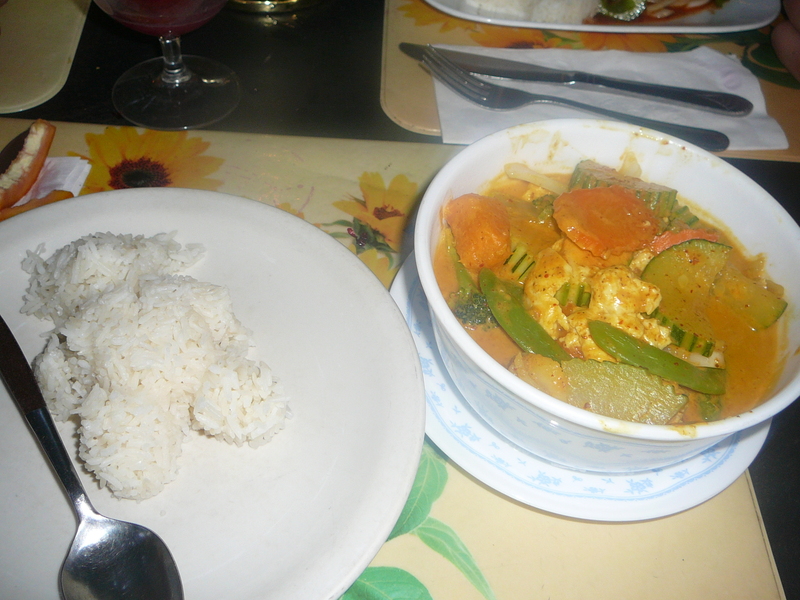 We all choose Thai, and I had my first yellow curry. Very yum. Dinner was followed by walking around the cute town, the bro and his GF trying out chocolate covered bacon, and then we all ended our food fest with ice cream. Homemade ice cream is always a good thing. Teddy bear shaped rice with my yellow curry. Sunday: Sunday was supposed to be a beach day, but it was raining. We slept in and then headed to a famous Princeton pancake spot, PJ’s Pancake House. 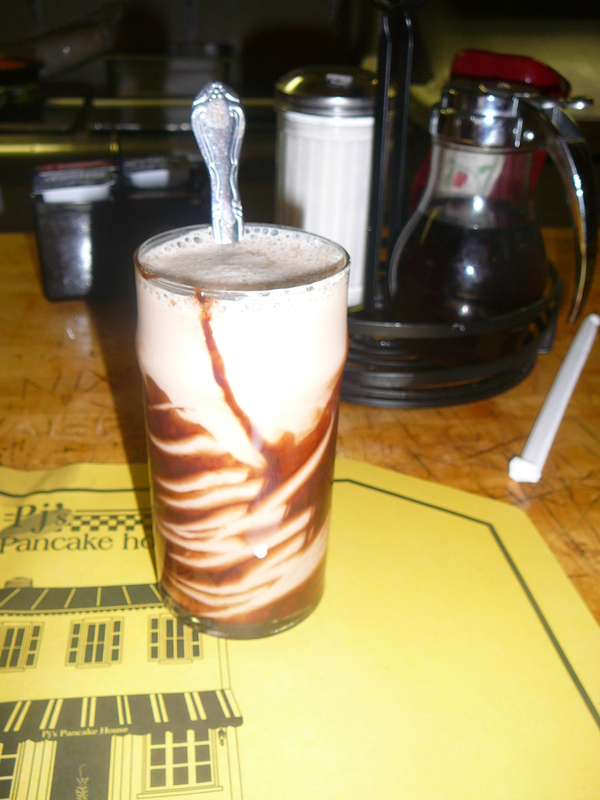 We ate at the counter, which made me feel like a kid, so I went with that feeling and ordered a chocolate milk. It really hit the spot. 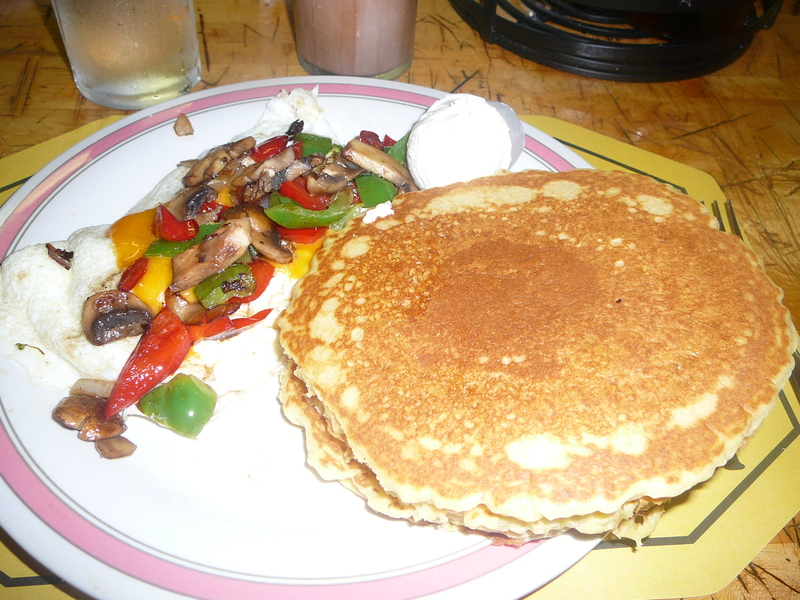 My egg white veggie omelet with a side of pancakes was huge. I ate two of the pancakes, but failed to eat the rest. Next time, I must remember that my eyes are bigger than my stomach (sometimes). We spent the rest of the afternoon food shopping (outside of NYC = real super markets) and playing lawn sports when the rain finally let up. My parents joined us for a pizza party at night and supplied a strawberry shortcake. Yes, this weekend was a fattening fest. Monday: We were up early to head back to our apartment. Chris and I spent the rest of the day prepping for our Fourth of July party. 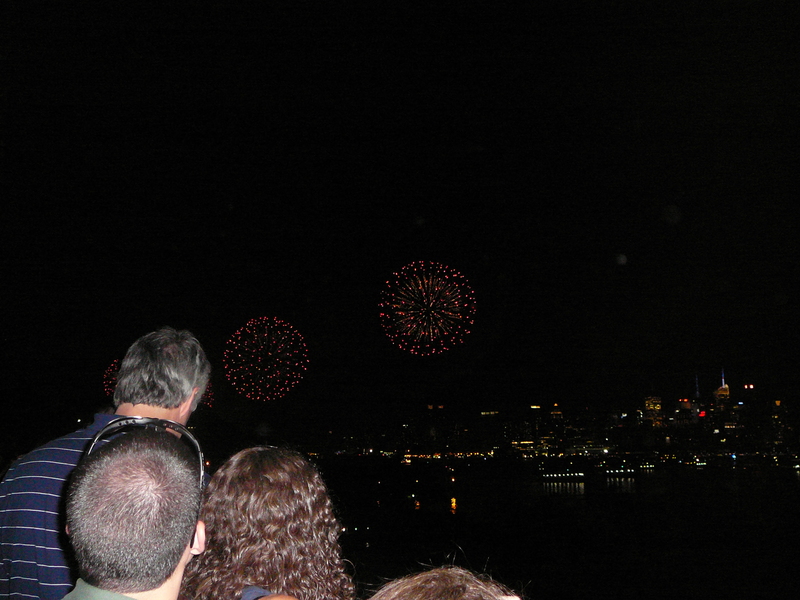 We are lucky to have a view of the Macy’s fireworks from our apartment terrace, so we invited over friends to share in the festivities. It was the first time I saw the fireworks live (something I’ve always wanted to do), and it was really great to be able to do so surrounded by friends both old and new. All in all, it was a wonderful weekend. Let freedom ring (they looked better in person!). Now it’s back to eating healthy. Today so far = chobani kids yogurt with honey bunches of oat cereal for breakfast and a TJ’s frozen Indian meal for lunch. Some fresh sliced strawberries and blueberries are coming up soon for a snack. You know what, healthy is yummy, too! How did you spend your Fourth of July weekend? When I was little, my dad would call me Little Miss Bossy. I hated the nickname then, but nonetheless, I’ve always had a fondness for the Little Miss characters. In fact, I have a Little Miss magnet on my fridge courtesy of the Target dollar bins that allows me to circle with a moveable magnet what Little Miss I am for the day. Last night, I was Little Miss Competitive. Sure, there isn’t actually a Little Miss Competitive, but work with me here. Since I’ve been doing Pilates 2x a week since February, sometimes the classes can feel a bit repetitive, and I feel myself slipping into an only okay workout. Last night, I started to feel that way at the beginning of class. I decided to create a game to remedy the situation. I decided that I was trying out for oh-say the Olympic Pilates event – because yes, if they had that I’d surely be top contender, hah – and had to stick every move perfectly. Well call me crazy (it’s okay, go ahead), but it worked. My ultra competitive side came out, and I tried my best to hold all the moves perfectly. I had a strong workout, and I’m currently watching my phone for a call from the IOC. After my competition workout, I was ready for a big dinner. In the summer, that means one thing, a big salad. I hard boiled eggs, while Chris chopped up all the veggies. In the mix was lettuce, tomato, onion, chickpeas, shredded cheddar, and hardboiled eggs. Chris surprised me by bringing home a French baguette to go with the brie I picked up for $2(!) 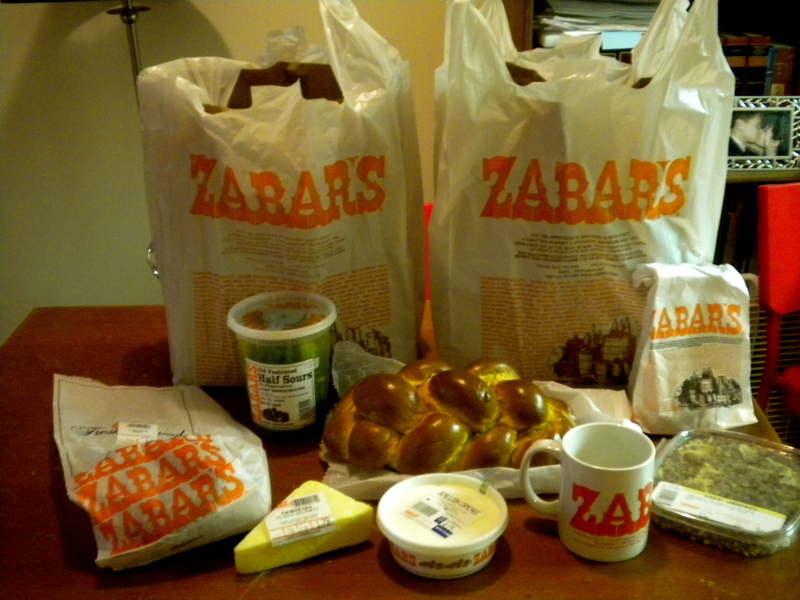 at Zabar’s the other day. It was the perfect summer dinner. We rounded out the night with a fabulous trip to the dog park. Often, Hadley is incredibly obsessed with playing fetch, but last night we refused to give him a ball. 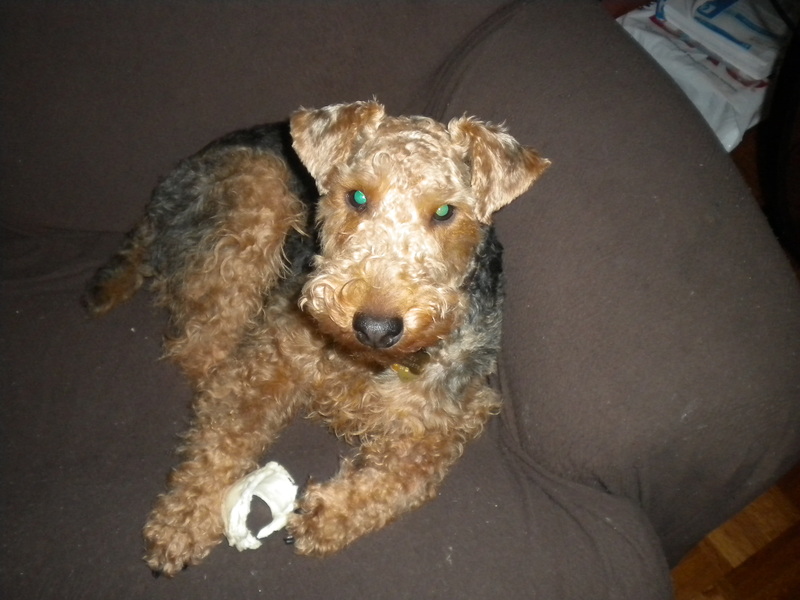 Eventually he relented and had a wonderful play session with another pup. 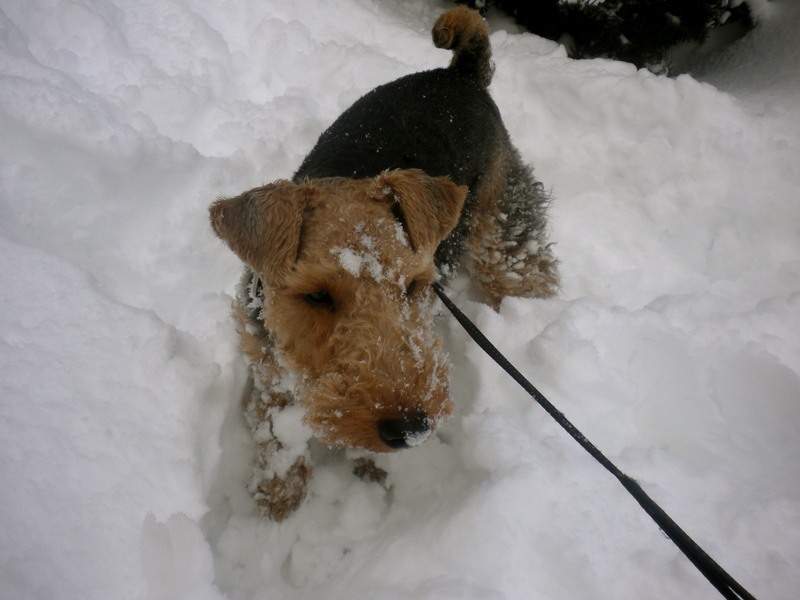 My little welshie is learning lessons! The night ended with my catching up with Friday Night Lights and enjoying some dark chocolate pudding I whipped up. Instant pudding is currently one of my favorite quick snacks. A ½ cup is all I need to cure my chocolate cravings, and I get a serving of dairy in. Double score. Oh, and let’s end this post on something exciting: Chris and I signed up for our first 5k on July 12!!! What Little Miss (or Mr.) are you today? Rain was pouring down in the city off and on all day. I had the pleasure of getting stuck in a downpour on my way back from lunch. I didn’t have an umbrella, but I did have a cardigan. I ended up wrapping it around my head Fiddler on the Roof style and running back to work. After work, the rain let up, so naturally it was time to take Hadley to the dog park. 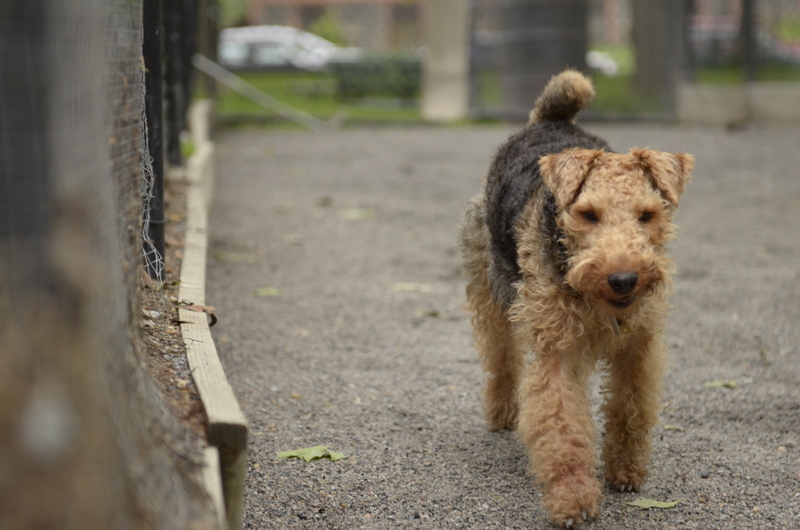 Chris's sister took this picture on her last visit, but this is his typical dog park look. Then, I made my way to Pilates. My Pilates instructor told me that it seems like I’m getting a lot stronger and that I’m keeping my legs straighter during the exercises. Success! I felt pretty dizzy during class, though, but I’m pretty sure its because I have to exercise without wearing my glasses. Once I put them on after the workout, I was fine. How do other glasses wearers deal with this issues? Unfortunately contacts aren’t an option for me. Ceasar salad! But not just any ceasar salad, I made tuna steak ceasar salad. A friend recently convinced me that tuna steak is super easy to make. It turns out she was right. I bought two frozen tuna steaks from TJ’s, set them out to thaw while I was at Pilates, rubbed them with salt and pepper, and then cooked them in a frying pan for 3 minutes on each side. I added one steak to my ceasar salad. 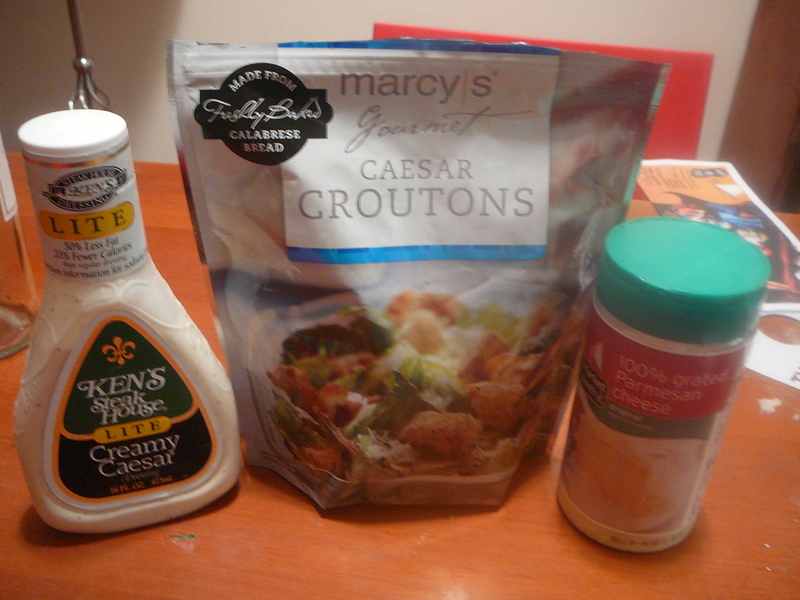 Instant fancy ceasar salad! Tomorrow, I’ll enjoy the second steak in a sandwich. 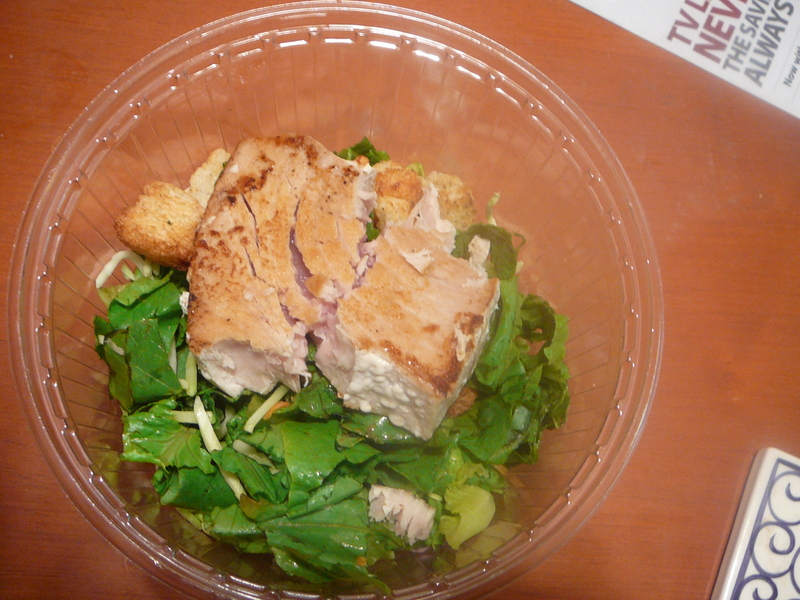 Tuna steak makes my salad seem fancy. Learning how to make tuna steaks was a good lesson for me. Even if something seems hard to do in the kitchen at least check it out. It may be a lot easier than it seems. I always was afraid to try cooking tuna steak, because it seemed difficult to cook it just right. Now I’m thinking about taking on homemade pasta this weekend, but we’ll see. I spent the rest of my night watching HGTV. Kelley recently introduced me to this channel, and I’m hooked. Even though Chris and I are still ions away from buying, it’s fun to watch other people find their dream homes. 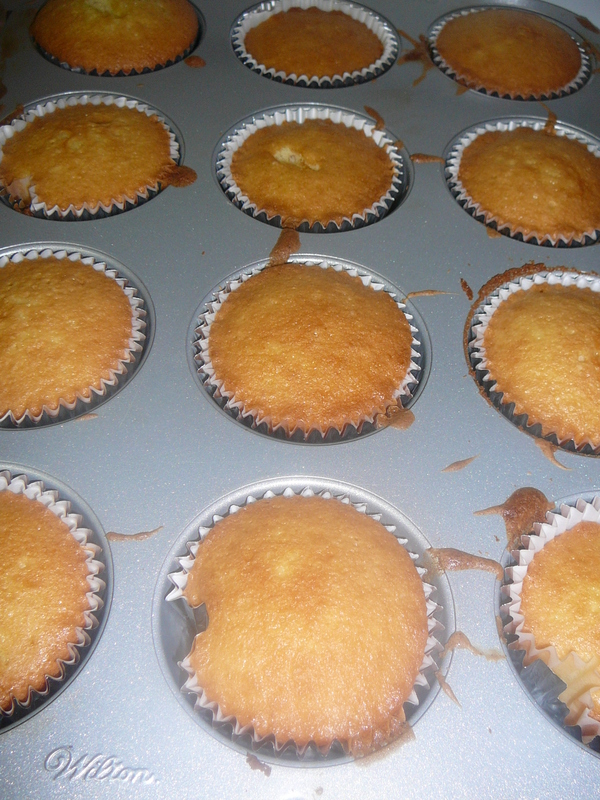 I winded down the evening making a batch of cupcakes to bring into the office tomorrow. They all couldn’t fit into the container, so Chris and I were forced to eat one each. Such is life. Lauren and I are on a quest to find our favorite falafel place. To achieve this goal, we have to try lots of different falafel. Hard, I know. Two weeks ago, we tried out Mamoun’s. 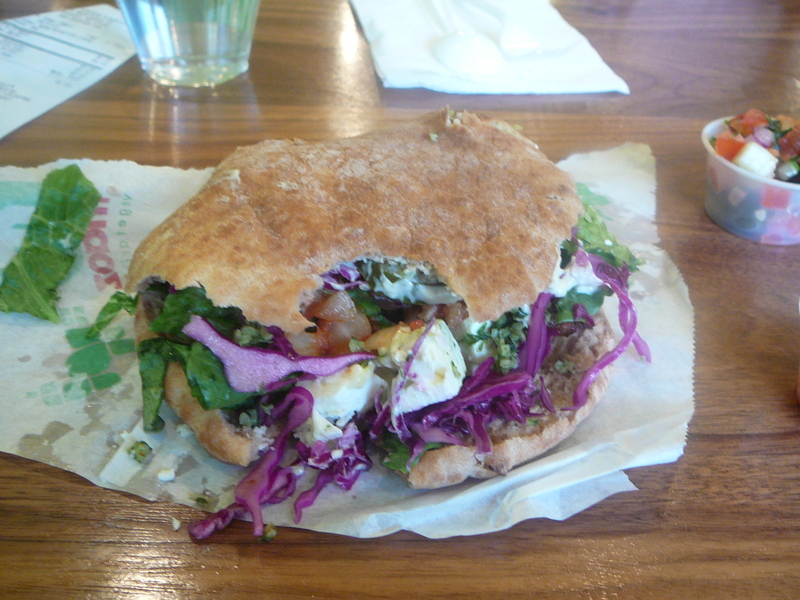 This week, it was time to try out a popular falafel chain, Maoz. 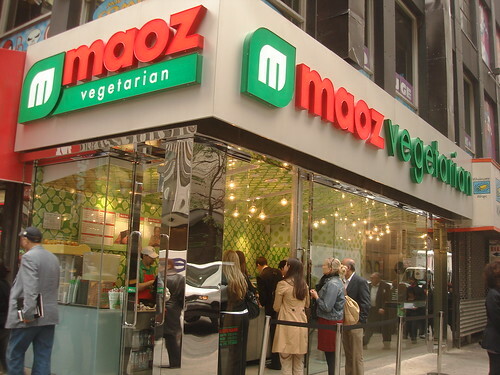 I’ve heard good things about Maoz from friends, but in general I’m always weary to try out any chain place (including Mamoun’s which is a smaller chain), because I never find chains to be good as individual restuarants. Still, it was on the list of falafel places, so last night we hit it up. One of their many locations. We both order falafel pitas. I chose to add feta to mine (everything is better with feta) and paired it with a soda. It came out to a little under $9. This was more expensive than the uber cheap Maumod’s, but still cheap for NYC standards. I learned that I cannot properly stuff a pita. My pita was so overstuffed that I lost a falafel ball to the floor. This was pretty sad, until I tried the falafel and decided it didn’t have much flavor. In fact, the whole thing just didn’t taste right. The feta was chewy and tasteless – I never don’t like feta so this was a big thing – and a lot of the pickled veggies tasted sort of sweet. Really, the whole thing was just odd and a disappointment. So Mamoun’s v Maoz? Definately Mamoun’s. After our disappointing dinner, Lauren and I decided we needed something reliably tasty. We took a walk and grabbed Italian ices. Lauren was sweet and bought mine for my belated birthday, so I went all out and threw some custard on top to celebrate. 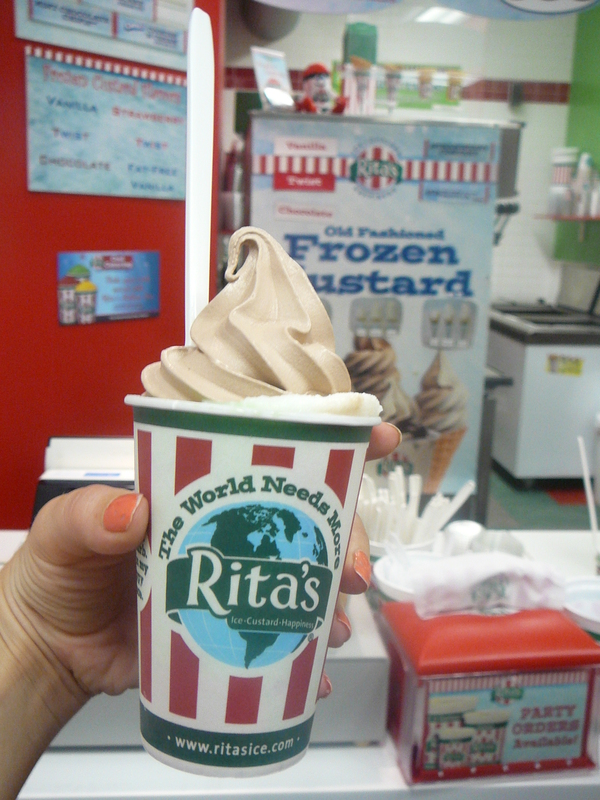 Mint chocolate chip and cheesecake ices topped with chocolate custard. Yum! Chris worked late so I took the time to do me-time things. 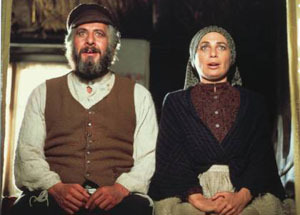 I watched the Oprah finale I DVRed, which was a bit of a let down. Then I read Women’s Health in bed, and learned some great information. I just ordered a year-long subscription last night for $5 from a deal site. They offered me to add a subscription for Self for $2 additional. Lots of good magazines are coming my way! What are your favorite me-time things to do? Favorite magazines? Yesterday was a glorious day. We inched our way into the 80’s for the first time in so long. Immediately after work, I took Hadley to the dog park. 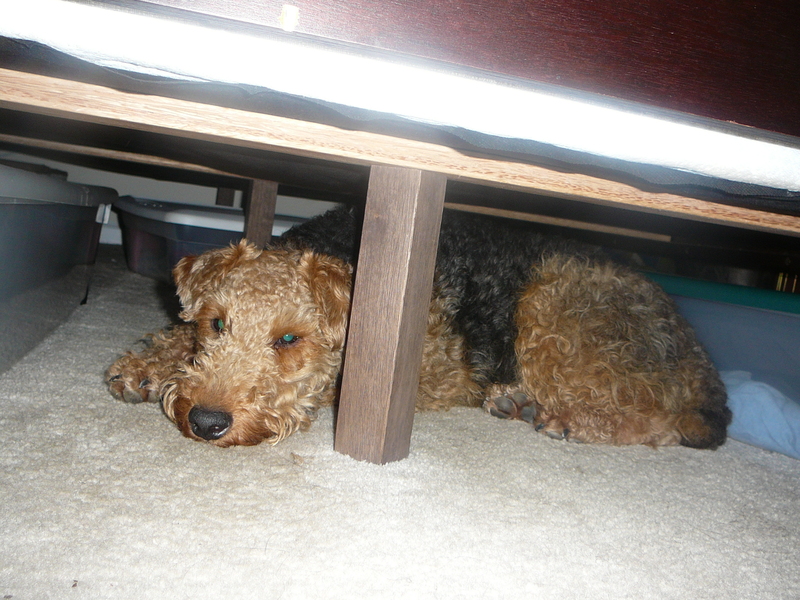 He ran around in the heat for a good hour and played up a storm. When we left the park, he lied down and refused to get up. I tried to get him to move, but to no avail. Finally, I just carried the lazy bum inside. He’s not spoiled or anything. Hadley passed out on the hardwood floor fully exhausted while I got out of my play clothes and into nicer duds for dinner with my parents. Chris joined us and we headed out to a brick oven pizza place. My parents brought a cake for me to the restaurant, and I drew a lot of attention. A woman insisted I cut her in the bathroom line as my birthday gift. I actually thought this was a pretty awesome gift. My dad, Chris, and I split a well done pie with extra cheese and mushroom. Asking for a pizza pie well-done is my pizza ordering trick. It makes the pizza so much better when they do it right. Last night, they did it right and the three of us polished off the whole pie, while my mom munched healthily on her salad. The meal was ended with my yummy birthday cake. To make up for the extravagance of the past few days, today I am eating healthy all the way. Breakfast was greek yogurt mixed with Honey Bunches of Oats. This is my favorite breakfast ever. Lunch was also pretty great: white rice, broccoli, and a Morningstar Chick Patty all mixed together with a pear. Of course, I’ve been snacking on baby carrots throughout the day. My goal of the weekend is to eat healthy every meal with the potential exception for Saturday night when I’m going out with friends for my birthday. It will be a bit of a challenge, since I’ve been off the healthy eating wagon this past week. Also, my best friend from college, Kelley, is visiting this long weekend, and one of our favorite things to do together is try out different foods and bake. We will just have to focus on eating healthy! Now I ask you a question. Warmer months means more visitors. 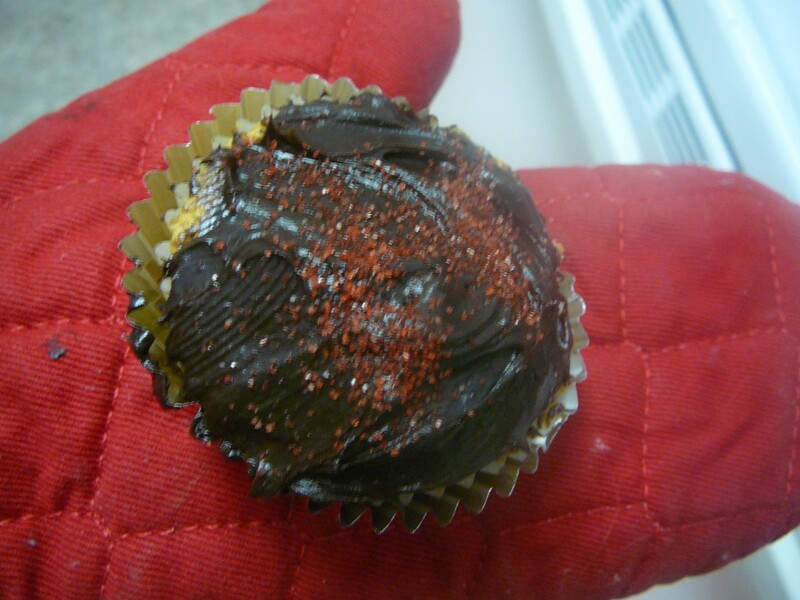 We had visitors last weekend, and I ate horribly (wonderfully, but horribly). We are having the lovely Miss Kelley this weekend. We are sure to have more visitors in the near future. When people come to visit, you want to take to your favorite places to eat. 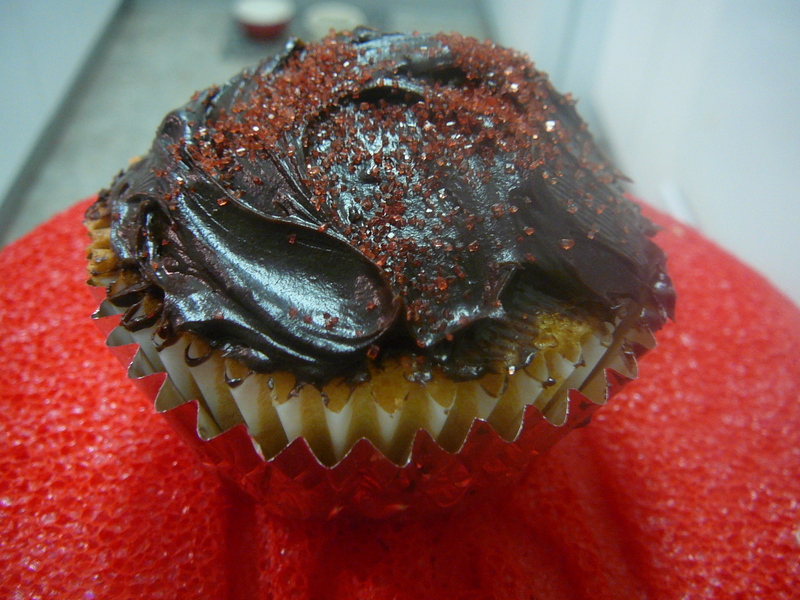 Often, those aren’t the healthiest places – they are often your “treat” places. This past weekend, we went with our guests to a great pub, Good Restaurant, Grom gelato, our favorite Indian, place, our favorite Italian place, etc. All were so so yummy, but I know that my body isn’t the best for it now. What are your suggestions for eating healthy when you still want to show off your favorites to your guest? Hopefully, I’ll have some recs for you after this weekend!